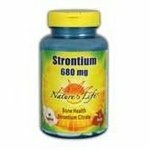 The strontium 680 seems great my biggest advice is to shop around. I think the best place to purchase would be over the web. I think this really helps. I have hyperthyroidism and I am loosing bone mass probably almost faster than this is helping me rebuild it. The pills are huge. the dose recommends 2 per day and futher to take on a empty stomach I don't care for any of those bits of info.